This track comes courtesy of Brian Rankin, a certain bespectacled wielder of red Strats who recorded many a chart-topping track after changing his name to Hank B Marvin! Most of the Shadows’ early hits were composed by the likes of Jerry Lordan (Apache, Atlantis, Wonderful Land) and Norrie Paramor (The Savage, The Frightened City, Peace Pipe) but this selection (which became the group’s fifth UK number one in 1963) is of particular interest to us plank-spanking types because it was penned by Marvin himself, with the assistance of rhythm guitarist Bruce Welch. By way of a brief summary, Hank used (and indeed continues to use) a Fender Stratocaster through the clean channel of a valve amp, with an “Echoes From The Past” system to provide a little ambience. Around the time of Foot Tapper this would most likely have been an Italian-made tape-loop echo marketed by Vox. In fact, legend has it that Foot Tapper is a description of Hank’s method of synchronizing the delay time of his echo unit with the tempo of the song – a refreshingly simple intuitive approach, compared with the millisecond arithmetic required by most modern digital delays! However, the echo is not a particularly prominent feature on the original and the audio track version was recorded with just a splash of reverb, so you can hear how the track sounds without the technology to emulate Hank’s set-up perfectly! In general, the best results for this track will be obtained if you use the treble pick-up, muting lightly at the bridge with the right hand palm. For the sections marked ‘TA Vib’, cradle the tremolo arm in the crook of your R/H little finger, so you can easily add the all-important ‘twang factor’ without having to move your picking hand away from the strings. There are a couple of slight twists in the song structure, so I’ve written out the whole thing without any codas or repeat marks for ease of reading. The track clocks in at just over two and a half minutes and presents no real technical challenges, so prepare to twang… Bars 1-8: This intro brings in the first recurring theme of the track. Note how the melody is strongly linked to the chord structure, and how you could guess the chord progression just from hearing the melody on its own. This is because the melody consists predominantly of notes from the triads of each chord, (ie C, E and G for C major, A, C and E for A minor, F, A and C for F major and G, B and D for G major). Be sure to mute lightly at the bridge (over-zealous muting gives an inappropriate Hank Di Meola effect!) and observe those CO markings to get the upbeat, slightly cheeky sound heard on the original. The exceptions are a couple of Ebs and Bbs, which are chromatic passing tones and sound all right because they are used to link up two consecutive scale tones, rather than part of the melody. Bars 21-32: This is pretty much the same as the preceding section until we get to bars 31-32, where the chord progression returns to C for 2 bars, as a preparation for the next section. 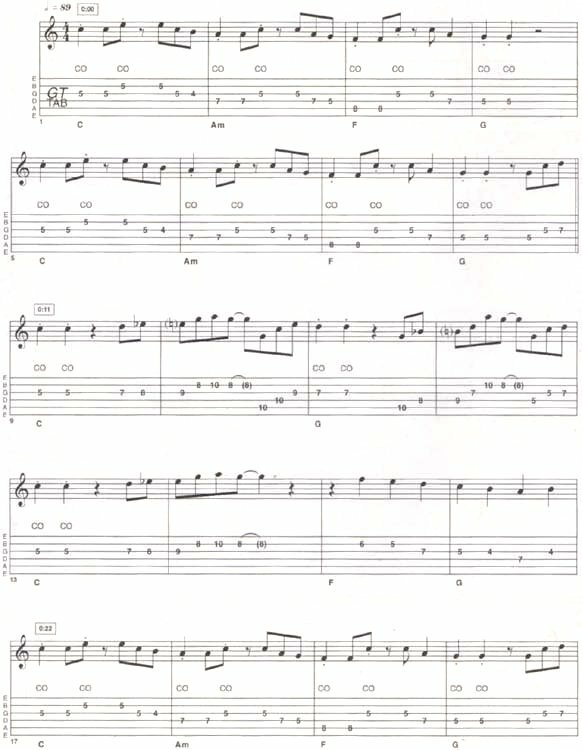 Bars 33-48: This new section starts with some double-stopped 3rds on the A and D strings -once again derived from the C major scale. The picking hand gets a bit of a break here, so now is a good opportunity to experiment with the tremolo arm, curling the right hand pinky around it as mentioned earlier (be particularly gentle if your guitar has a locking trem, such as the Floyd Rose system: if you treat it like a traditional Fender bridge, the notes will be detuned too far and the result will be a decidedly un-Hanksome underwater sound – so exercise caution!). Bars 49-60: This section is similar to bars 21-22, but note that bar 60 contains a lead-in to the breakdown section. Bars 61-76: And here’s the breakdown section, where Hank’s minimalist melody outlines the chord progression C-G-C-F-C-G-C over sparse accompaniment. Note the symmetry of each two-bar phrase and how an appropriate triad note marks each new chord change. Bars 77-92: These bars correspond to the earlier double-stopped section (bars 33-48). Bars 105-112: The ending. Watch out for the timing of the low staccato Cs in the last few bars – this is an occasion where accurate timing is effective and any other sort will sound sloppy! On the original, Bruce Welch contributes an acoustic rhythm part, but it’s low in the mix and there are several parts where it’s almost impossible to hear exactly what he’s playing. So, I’ve transcribed the audible bits and filled in the gaps with something stylistically appropriate. The result can be heard on the backing track and I’ve written it out after the main transcription so that you can use it in a two-guitar situation if you want to. 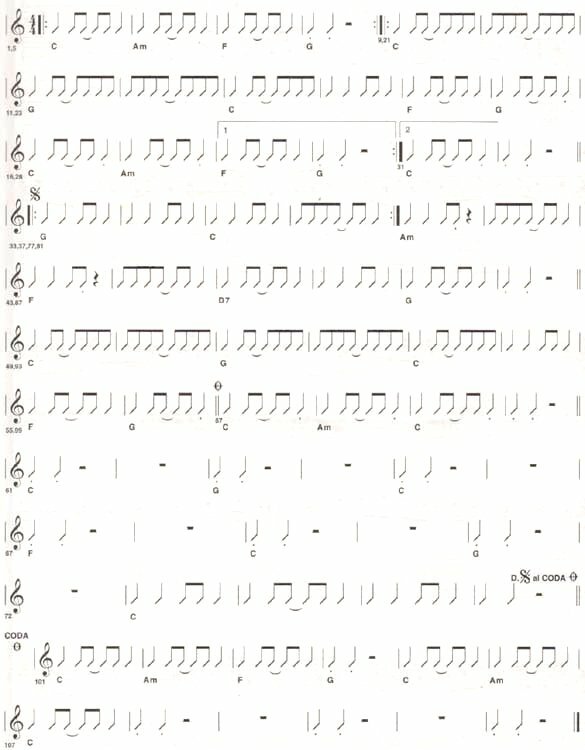 It’s just a part of The Shadows Foot Tapper guitar tab and sheet. Hi Neil. Thank you for the comment, glad to help you. © 2012 - 2019 TabsClub Powered by TabsClub 40 queries in 0.265 seconds.